Friday~ The last day for class in one week, I believe everybody will have the feeling "Oh~finally I make it til Friday, tomorrow holiday :D" Even for Friday, I'm having three classes: Basic electronics and application, Entrepreneurship Engineering and Japanese Language~From the title it's obvious that this post will be talking about Entrepreneurship, but Rocky?? One of the thing I'm happy about is that I got lecturer that can talk English very well, and this semester my Entrepreneurship Engineering lecturer is Mr.Murray Hunter, who is from Australia talk fluent English ^^. Another thing is for the second time of his class he still haven't teach us anything yet, and today he ask all of us to watch movie~ I don't get it =.=?? 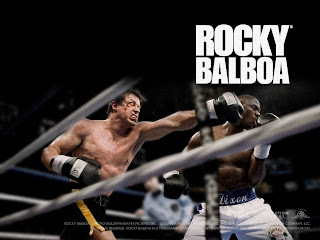 A 2006 American movie, the last sequel of Rocky film series, directed by and starring Sylvester Stallone tells the story of Rocky, now retired from boxing for 20 years, living alone after his wife, Adrian had died from cancer several years previously. He now runs a Italian restaurant named after her wife, where he will share with his customers stories of his past. Unfortunately, he is also battling personal demons involving his grief over Adrian's death, the changing times, and his eroding relationship with his son Robert. 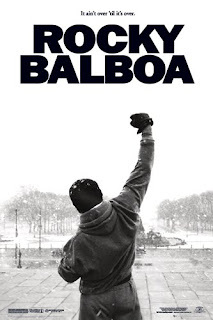 It ain't about how hard you hit; it's about how hard you can get hit, and keep moving forward. anyway, i was on the phone wit some Aussies few days back regarding some products (no the bill wasnt charged on me). god, their slang was so difficult to understand! i had to like "sorry, can u repeat that again?" like 100 times. haha. i mean, english is one of my top language i use in everyday life but it was difficult for me. Love your quote again...nice one!